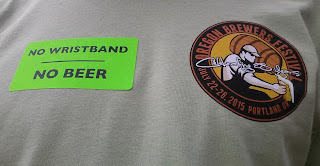 My going rate is usually a bit more than $3 an hour, but that's what it worked out to yesterday at the Oregon Brewers Festival. 5 hours of pouring beer for $15 in beer glass (plastic cup) and tokens. That ROI doesn't pencil out for some, but I'd say I came out of the deal pretty good. This was my first time volunteering at a beer festival and I wasn't sure quite how it worked. I was pleasantly surprised when I showed up and was able to pick the beer I was going to pour. Seeing Emerald Triangle IPA by Eel River was exciting and I immediately grabbed the Humboldt brew. Over the next several hours of serving I got the chance to explain where Fortuna, California was to many people and also reminisce with others about living in Humboldt County. The great part about Wednesday afternoon at OBF is there is time to talk with those pouring your beers and those you are pouring for. not an entirely IPA focused crowd. Being summer there was a dearth of stouts and while I didn't try it I heard great things about the Fort George Summer Stout. Here's what I did try and thought. Green Flash Brewing Co, Soul Style IPA - Most recommended (to me) beer of the night. Old Town Brewing Com, 1-Up Mushroom Ale - How can you not try this one? Port Townsend Brewing Co, The S.H.I.P. Sunriver Brewing Co, Oh MANdarin! Living in Portland sometimes you round the corner and find yourself at a beer festival. I've found myself at many beer festivals over the years, almost always on purpose. There are too many to attend all of them, though I am interested in hearing about each one that pops up or comes around again. The Oregon Brewers Festival, the biggest and best/most crowded/worst/craziest of the year is one I've always made time for. This year will be different. I'll be starting out the festival by pouring, not drinking. My favorite time to go is during one of the least crowded times, the weekday afternoon/evening. This year instead of walking up to the beer of my choice with no lines on a Wednesday afternoon, I'll be behind the table handing out the samples or full glasses. This is not an entirely altruistic outing. I'm looking forward to the free tokens. The best beer, outside of the beer in front of you, is free beer. Disclaimer aside, these festivals are possible because of a huge amount of hard work by the organizers, brewers and vendors, sponsorship and of course, volunteers. Since I can't have the beer I brew there (yet), nor have any food or merch for sale, nor a business to advertise I'll do my part by pouring beer. OBF brings out the creativity in some brewers and I hope to have something interesting to pour. Some brewers bring a flagship or other well known beer and honestly I'd rather be pouring some experiment that makes people remark for better or worse than something I could buy at the store. 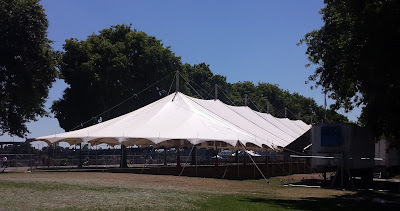 The tents are going up and people are getting excited. I can almost see them from my office and from the right room I can hear the cheers. I'm eager and a bit nervous to pour at my first festival. Hopefully I'll see some familiar faces and hand over a beer or two. I'll be the guy in the volunteer shirt. Heading down to San Diego many people asked if I was going to visit Stone. While that is on my list it was not destined for this trip. My brother in-law wanted to take me over to Ballast Point and I certainly wasn't going to say no to that. 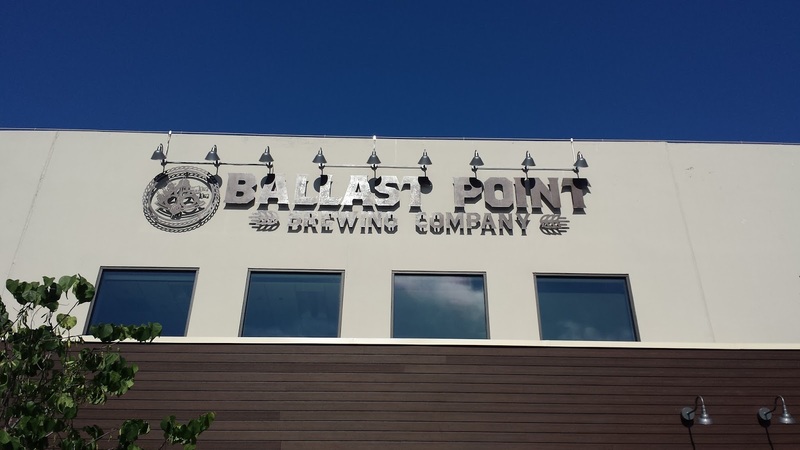 There isn't a huge variety of Ballast Point beers available in Portland so I wasn't sure what to expect. It didn't take long before I was sold on the BP tasting room. This is what tasting rooms should be like. It was open and airy inside, plenty of outdoor seating and good views to the brewing area. The beer menu was extensive with beers grouped in rough styles and labeled as Main, Specialty and R&D beers. 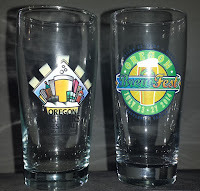 The pricing was good with $2 4 oz tasters or 3 tasters for $5. 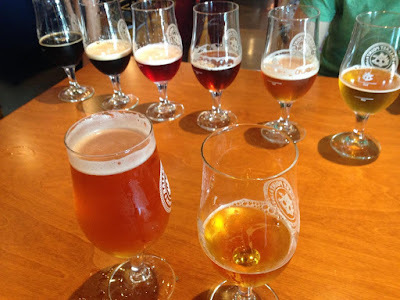 I picked out a group of six beers spanning the styles and leaning more on the specialty and R&D. Did I mention the generous "4 oz" pours? Ve-Lure - Golden oatmeal Stout-NITRO - 9.4%: An oatmeal stout w/ notes of chocolate and earthy notes of beets. And coco. The Commodore American Stout - 6.5%: Black in color with roasted flavor and notable hop bitterness. Indra Kunindra Export Stout - 7%: A burst of curry, cumin, cayenne, coconut and Kaffir lime leaf. Brother Levonian - 5.5%: Belgian Style Saison with hints of orange and honey. Our server lined up my samples in drinking order. I hadn't thought of putting the two hoppy 10% beers near the beginning, but he had a point about getting them before the darker beers. Baja was a perfect summer BBQ beer and opener. Neither the Tongue Buckler nor the El Dorado was overpoweringly hoppy. In fact, the El Dorado went down way to easy for a 10% DIPA and could get a person in trouble if they weren't paying attention. Drinking the Ve-Lure was like drinking chocolate milk, really dark rich chocolate milk. Putting this on nitro was the right choice. The Commodore was a good, but not spectacular stout, though I may have had a bit of taste fatigue at this point. That didn't stop me from fully tasting the Indra Kunindra. It was like eating from a food cart. It was the Chaat House in a glass. This was liquid curry. Glad I tried it, but very glad it was only a taster. I asked the server for a recommendation on how to end on a better note. The Brother Levonian was his current beer of choice. Belgian saisons aren't something I drink very often, but this did end the day well. The staff was amazing. Our waiter took time to answer questions, make recommendations and talk about the beer. There seemed to be quite a number of staff on hand and they could definitely handle the crowd. More than once a few of them would start singing along with the music and get many others, staff and customers, on board. 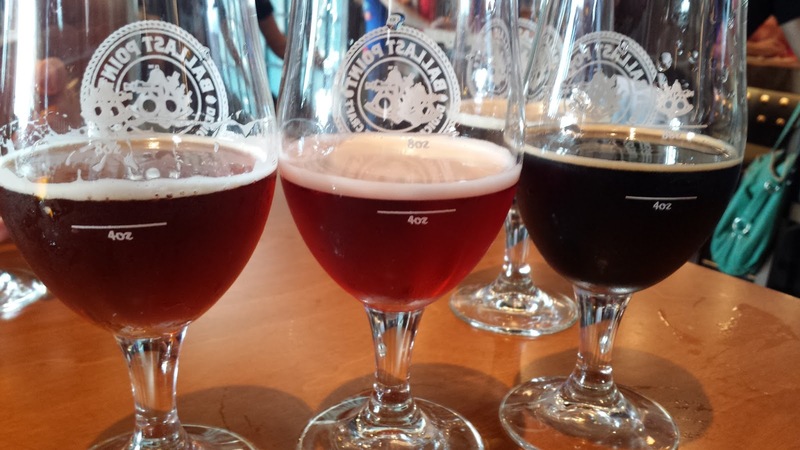 A bit of Bon Jovi with lots of backup makes any tasting session better. This was the big and newer tasting room, with the smaller one not too far away. I hear there are tours at the smaller one, hopefully I can go there next time.